The first thing that struck me when I sat down to play Raji: An Ancient Epic recently was the game’s art-style. Sure, it might have looked pretty with its bold use of colour, but it was the medieval architecture, inspired by that of the northern state in India, Rajasthan – said to be the absolute peak of Indian architecture – that really captured the imagination, and more importantly, my attention. Raji: An Ancient Epic is a 3D isometric action-adventure video game set in ancient India and follows the journey of the eponymous Raji, a young girl desperate to save her younger brother from a looming threat. With the world invaded by demons, Raji, who was chosen by the Gods, must battle dark forces on her way to defeating Mahabalasura, the demonic overlord, and save her brother from almost certain death. It’s a fairly simple game in truth; using one button to melee attack, another for a ranged attack, one to evade and another button to perform a super. That’s it, really. It’s not really anything to get excited about from a gameplay perspective – well, based on our relatively brief hands-on, that is – and actually got quite repetitive rather quickly. But what keeps you playing is the game’s setting. The world. The art-style. The environments. And to break up the monotony Nodding Head Games throws in the odd puzzle here and there too, and they certainly do help mix the game up infinitely. If you’re interested in seeing what Raji: An Ancient Epic looks like, here’s almost seven minutes of gameplay with mine and Rich’s colour commentary, and while you're watching, take a minute to soak up the really cool environments. It’s completely worth it. 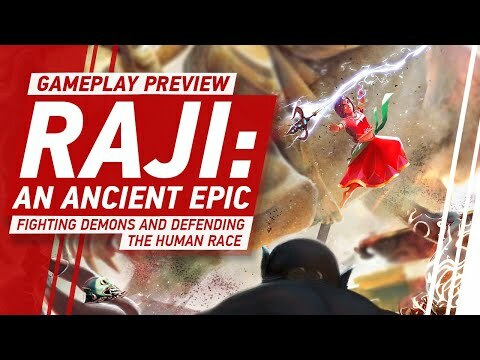 Raji: An Ancient Epic is coming to consoles and PC in Q1 2020.